Swan Beach has an interesting name, because when people come out to this secluded stretch of the North Outer Banks they are not looking for graceful winged creatures. 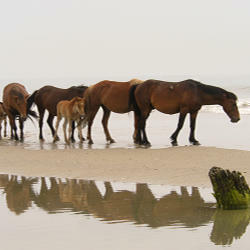 Swan Beach is known by locals and tourists in the know as one of the best places in the Outer Banks to watch the wild horses in their natural habitat. When you book your vacation in Currituck, you may be interested in a trip up Swan Beach. The soft sand feels great on your feet, but bear in mind that it’s not an easy destination. Swan Beach in the OBX is about three miles north of the beach access ramp in Currituck, which means if you park where the road ends you’ll have to do some hiking! No worries, though, if you have a 4×4 vehicle you can ride out on the sand, or you can book a horse-watching tour with the many companies in Corolla that guide visitors to where the horses are found. You’ll love the Swan Beach area for its serenity and beauty. This part of the OBX borders the Currituck National Wildlife Refuge, so you may also see marsh birds and other animals native to North Carolina enjoying the sunshine. It’s like stepping back in time to when the early settlers first encountered our coast. There are a few vacation homes for rent in the area, which require a 4×4 vehicle to access, so if you really want to get away from it all you can bring the family and celebrate a reunion or holiday at beautiful Swan Beach. Enjoy a perfect sunrise, then hop over the dunes into the water! Keep an eye out around your rental, too, because you may have a few four-legged visitors. Be aware that local laws forbid you to make physical contact with the wild horses, but definitely bring a camera.